This stranded snake needed a hero, but volunteers were in short supply. That is, until one brave woman named Camila came along to save him. Video captured by a passing biker shows the large, slithering reptile stuck in the middle of a mountainous highway in Guaratiba, Brazil. Traffic had been brought to a standstill as motorists stopped to gawk, but the snake was apparently halted, too, in fear of all the cars around him — and no one seemed too eager to help. No one except Camila. 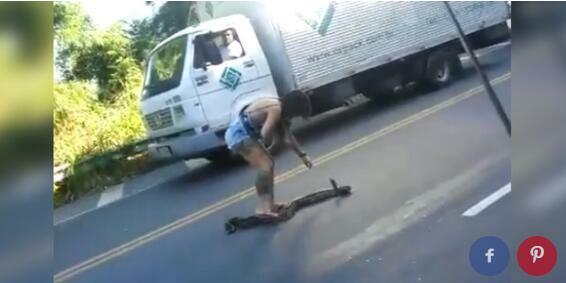 Fearing, perhaps, that the snake would be run over by impatient drivers continuing on their way, the brave woman stepped in to move him off the road. Not even protests from her less-courageous friends could stop her from doing what needed to be done on the animal's behalf. "Camila, he's going to bite you!" a male companion can be heard saying on video, to which Camila replies: "Shut up." She then scooped the snake up into her arms. The video clip ends as the woman's friends stop to take her photo (who can blame them, really? ), but the snake was presumably then set free safely on the roadside. At that time of this writing, Camila's background isn't known, though the ease with which she corralled the snake hints that she may have prior experience with handling reptiles. Ideally — especially when it comes to dealing with potentially dangerous wild animals — wrangling is a job best left for professionals. Still, we're glad this snake's ordeal had a happy ending.